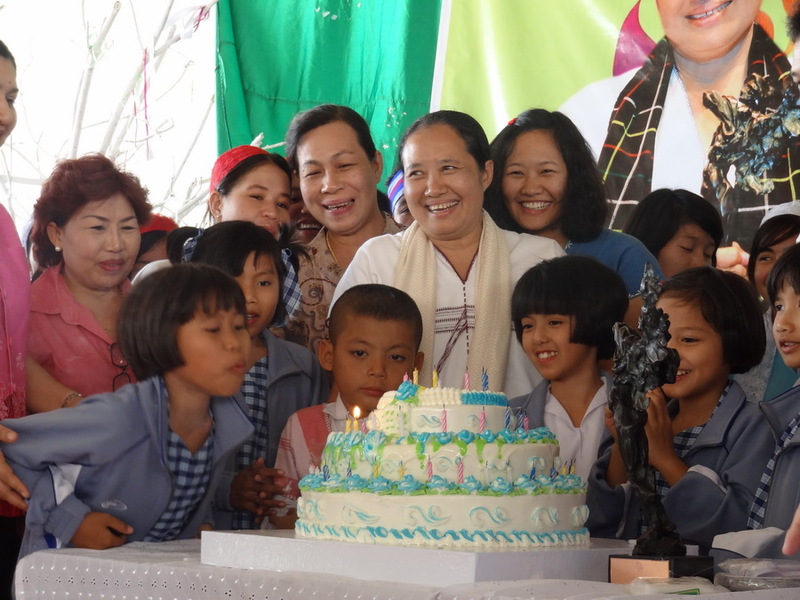 Thousands of well-wishers turned up at the Children Development Center, a migrant school based in the border town of Mae Sot to celebrated Dr. Cynthia Maung’s 52nd birthday on the 6th December. Dr Cynthia founded the Mae Tao Clinic in 1989 to treat refugees and migrant workers from Burma. The Clinic is located in the Thai-Burma border town of Mae Sot. Dr Cynthia’s birthday celebrations started at 9:00am with traditional Karen dance by migrant students from the CDC school. The attending the celebrations included local Thai community leaders, women groups, youth groups, and members of social and political organizations. The celebrations were followed by speeches from Lway Nway Hnoung from Women League of Burma, U Bo Thoung, a volunteer at the Mae Tao Clinic, Khun Manida from Thai Education Ministry, and Dr. Cynthia’s son and daughter. May Thant Zin Maung, daughter of Dr. Cynthia was said in her speech. Following the speeches, birthday candles were lit by, students, who surrounded Dr Cynthia, singing happy birthday to her. U Maung Maung Gyi, vice chairman of the CDC school education committee said the birthday celebration was for a mother who is wholehearted doing social works and giving help to those in need with love and care. Dr. Cynthia Maung’s clinic treats as many as 140,000 Burmese people a year and has been open for 23 years. DR Cynthai is also involved in health, education and other social issues is the chairperson of Burma Medical Association and Back Pack Health Worker Team. Dr. Cynthia Maung came to the Thai-Burma border and founded Mae Tao Clinic in 1988, after the 8888 Uprising led by students in Burma. From 1999 to 2011, she received 18 human rights awards given by different international organization and institution.